As with a lot of popular television shows, especially the animated ones, it’s not unusual to see a celebrity depicted every now and again. Think Barbra Streisand, and Robert Smith of The Cure in South Park (surely you remember Mecha-Streisand), or Lauren ‘LC’ Conrad, of The Hills, and the band KISS appearing in Family Guy. 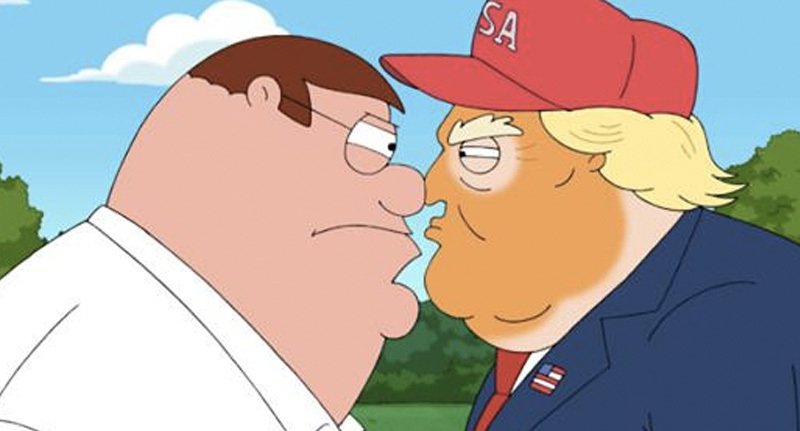 So it’ll probably come as no surprise to you, President Donald Trump – the 45th and current president of the United States – is set to ‘appear’ in Seth MacFarlane’s much-loved Family Guy. Many moons ago, in 2012, Trump – who was the host of American shows The Apprentice and The Celebrity Apprentice – tweeted his admiration for MacFarlane – but it’s something he might be about to regret, especially after the latest instalment from Family Guy airs. @SethMacFarlane will be a great Oscar host. He did an amazing job at my @ComedyCentral roast. In a snippet taken from the episode Trump Guy, Meg is introduced to Trump by his daughter, Ivanka. Pleased to meet you, Meg. You have a beautiful rack. Wait, it gets better though – that’s not where the punchline finishes. I was talking about my daughter. The episode is also set to feature ‘an epic, many-minute-long fight’ between Meg’s dad Peter, and Trump, after something is said to happen to Meg, according to executive producer Rich Appel, as per Entertainment Weekly. At least it’s not the flippin’ chicken for once though! When that hair is actually wet, it can be a cat o’nine tails. And it’s used quite effectively against Peter. Fox are said to not have any significant notes about Trump Guy – which has been updated with new scandals to keep the episode fresh. What we discovered, fortunately, that is unlike Omarosa, we did not need secret tapes to find a few things that are ridiculous and hilarious and depressing about the Trump administration. It wasn’t something where we were going to be besmirching of the office of the president of the United States because, you know, he’s doing that for us. Can’t wait for this to be honest! Even better is the fact it’s a two-part episode! Trump Guy is due to premiere on US television Sunday January 14, on Fox.